There are currently no models that match your filter criterias. Please revisit the filter to help find the right MINI for you! Licensing, registration, and applicable taxes are extra. ***Finance example: Selling price of a 2019 MINI Cooper Convertible is $31,935.00, which includes MSRP ($29,690.00) and Freight/PDI ($2,245.00), at 0.99 % APR for 60 months requires 120 bi-weekly payments of $243.21 with $1,100.00 down payment. Cost of borrowing is $3,027.18. Total obligation is $32,717.18. License, registration and taxes are extra and due on signing. ****MSRP starting price for a base model 2019 MINI Cooper Convertible is $29,690.00. Freight/PDI ($2,245.00), retailer administration fee (up to $399.00), OMVIC fee ($10.00), Tire Recycling Fee ($16.00), and A/C levy ($100.00) are extra. The free-spirited MINI featuring our world-class handling, a finely-tailored interior, and a 3-in-1 soft top roof for opening yourself up to all life has to offer. All-inclusive starting price for a base model 2019 MINI Cooper S Convertible is $36,760.00, which includes MSRP ($33,990.00), Freight/PDI ($2,245.00), retailer administration fee (up to $399.00), OMVIC fee ($10.00), Tire Recycling Fee ($16.00), and A/C levy ($100.00). **Lease example: Selling price of a 2019 MINI Cooper S Convertible is $36,235.00, which includes MSRP ($33,990.00) and Freight/PDI ($2,245.00), at 1.99 % APR for 48 months. Monthly lease payment is $415.54 with $1,350.00 down payment. First month’s lease payment, security deposit of approximately one month’s payment, retailer administration fee (up to $399.00), OMVIC fee ($10.00), A/C levy ($100.00), Tire Recycling Fee ($16.00), fees associated with PPSA ($53.73), licensing, registration and applicable taxes are extra and due on signing. Total obligation is $22,290.29 plus tax. The residual value of the vehicle at end of term is $16,995.00. Annual kilometers limited to 16,000. $0.15 per excess kilometer. Excess wear-and-tear charges may apply. ***Finance example: Selling price of a 2019 MINI Cooper S Convertible is $36,235.00, which includes MSRP ($33,990.00) and Freight/PDI ($2,245.00), at 0.99 % APR for 60 months requires 120 bi-weekly payments of $272.98 with $1,625.00 down payment. Cost of borrowing is $3,122.94. Total obligation is $37,112.94. License, registration and taxes are extra and due on signing. ****MSRP starting price for a base model 2019 MINI Cooper S Convertible is $33,990.00. Freight/PDI ($2,245.00), retailer administration fee (up to $399.00), OMVIC fee ($10.00), Tire Recycling Fee ($16.00), and A/C levy ($100.00) are extra. THE MINI COOPER S CONVERTIBLE. The sportier version of the MINI Convertible, featuring a lively 189-hp Twin Power Turbo engine at your command, premium cockpit technology at your fingertips, and unlimited headroom as standard. All-inclusive starting price for a base model 2019 MINI John Cooper Works Convertible is $44,260.00, which includes MSRP ($41,490.00), Freight/PDI ($2,245.00), retailer administration fee (up to $399.00), OMVIC fee ($10.00), Tire Recycling Fee ($16.00), and A/C levy ($100.00). **Lease example: Selling price of a 2019 MINI John Cooper Works Convertible is $43,735.00, which includes MSRP ($41,490.00) and Freight/PDI ($2,245.00), at 1.99 % APR for 48 months. Monthly lease payment is $508.01 with $1,500.00 down payment. First month’s lease payment, security deposit of approximately one month’s payment, retailer administration fee (up to $399.00), OMVIC fee ($10.00), A/C levy ($100.00), Tire Recycling Fee ($16.00), fees associated with PPSA ($53.73), licensing, registration and applicable taxes are extra and due on signing. Total obligation is $26,971.00 plus tax. The residual value of the vehicle at end of term is $20,330.10. Annual kilometers limited to 16,000. $0.15 per excess kilometer. Excess wear-and-tear charges may apply. ***Finance example: Selling price of a 2019 MINI John Cooper Works Convertible is $43,735.00, which includes MSRP ($41,490.00) and Freight/PDI ($2,245.00), at 0.99 % APR for 60 months requires 120 bi-weekly payments of $331.55 with $1,700.00 down payment. Cost of borrowing is $3,311.28. Total obligation is $44,801.28. License, registration and taxes are extra and due on signing. ****MSRP starting price for a base model 2019 MINI John Cooper Works Convertible is $41,490.00. Freight/PDI ($2,245.00), retailer administration fee (up to $399.00), OMVIC fee ($10.00), Tire Recycling Fee ($16.00), and A/C levy ($100.00) are extra. THE MINI JOHN COOPER WORKS CONVERTIBLE. The most powerful MINI Convertible available, featuring a range of exclusive upgrades including sport seats, signature design details, and a 228-hp Twin Power Turbo engine tuned to take open air thrills to an entirely new level. All-inclusive starting price for a base model 2019 MINI Cooper 5 door is $27,160.00, which includes MSRP ($24,390.00), Freight/PDI ($2,245.00), retailer administration fee (up to $399.00), OMVIC fee ($10.00), Tire Recycling Fee ($16.00), and A/C levy ($100.00). **Lease example: Selling price of a 2019 MINI Cooper 5 door is $26,235.00, which includes MSRP ($24,390.00) and Freight/PDI ($2,245.00), less credit ($400.00), at 1.99 % APR for 48 months. Monthly lease payment is $315.04 with $1,100.00 down payment. First month’s lease payment, security deposit of approximately one month’s payment, retailer administration fee (up to $399.00), OMVIC fee ($10.00), A/C levy ($100.00), Tire Recycling Fee ($16.00), fees associated with PPSA ($53.73), licensing, registration and applicable taxes are extra and due on signing. Total obligation is $17,115.55 plus tax. The residual value of the vehicle at end of term is $11,463.30. Annual kilometers limited to 16,000. $0.15 per excess kilometer. Excess wear-and-tear charges may apply. †$400.00 credit on new 2019 MINI Cooper 5 door models applies to lease option only. 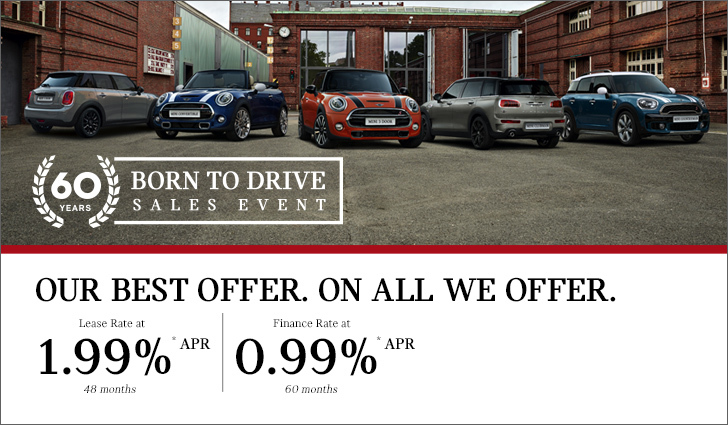 ***Finance example: Selling price of a 2019 MINI Cooper 5 door is $26,235.00, which includes MSRP ($24,390.00) and Freight/PDI ($2,245.00), less credit ($400.00), at 0.99 % APR for 60 months requires 120 bi-weekly payments of $198.53 with $1,065.00 down payment. Cost of borrowing is $2,483.48. Total obligation is $26,873.48. License, registration and taxes are extra and due on signing. †$400.00 credit on new 2019 MINI Cooper 5 door models applies to finance option only. ****MSRP starting price for a base model 2019 MINI Cooper 5 door is $24,390.00. Freight/PDI ($2,245.00), retailer administration fee (up to $399.00), OMVIC fee ($10.00), Tire Recycling Fee ($16.00), and A/C levy ($100.00) are extra. THE MINI COOPER 5 DOOR. The iconic and agile MINI hatch designed with a comfortable 5-seat cabin and up to 941 Litres of cargo space – ideal for packing more into your daily drives and weekend adventures. All-inclusive starting price for a base model 2019 MINI Cooper S 5 door is $31,460.00, which includes MSRP ($28,690.00), Freight/PDI ($2,245.00), retailer administration fee (up to $399.00), OMVIC fee ($10.00), Tire Recycling Fee ($16.00), and A/C levy ($100.00). **Lease example: Selling price of a 2019 MINI Cooper S 5 door is $30,435.00, which includes MSRP ($28,690.00) and Freight/PDI ($2,245.00), less credit ($500.00), at 1.99 % APR for 48 months. Monthly lease payment is $355.07 with $1,850.00 down payment. First month’s lease payment, security deposit of approximately one month’s payment, retailer administration fee (up to $399.00), OMVIC fee ($10.00), A/C levy ($100.00), Tire Recycling Fee ($16.00), fees associated with PPSA ($53.73), licensing, registration and applicable taxes are extra and due on signing. Total obligation is $19,826.94 plus tax. The residual value of the vehicle at end of term is $13,197.40. Annual kilometers limited to 16,000. $0.15 per excess kilometer. Excess wear-and-tear charges may apply. †$500.00 credit on new 2019 MINI Cooper S 5 door models applies to lease option only. ***Finance example: Selling price of a 2019 MINI Cooper S 5 door is $30,435.00, which includes MSRP ($28,690.00) and Freight/PDI ($2,245.00), less credit ($500.00), at 0.99 % APR for 60 months requires 120 bi-weekly payments of $229.80 with $1,300.00 down payment. Cost of borrowing is $2,484.05. Total obligation is $31,174.05. License, registration and taxes are extra and due on signing. †$500.00 credit on new 2019 MINI Cooper S 5 door models applies to finance option only. ****MSRP starting price for a base model 2019 MINI Cooper S 5 door is $28,690.00. Freight/PDI ($2,245.00), retailer administration fee (up to $399.00), OMVIC fee ($10.00), Tire Recycling Fee ($16.00), and A/C levy ($100.00) are extra. THE MINI COOPER S 5 DOOR. The spacious and sporty MINI Cooper S 5 door, featuring a 4-cylinder Twin Power Turbo engine capable of producing a top speed of 230 km/h, and a dual exhaust to amplify every second behind the wheel. ***Finance example: Selling price of a 2019 MINI Cooper Clubman ALL4 is $30,435.00, which includes MSRP ($28,690.00) and Freight/PDI ($2,245.00), less credit ($500.00), at 0.99 % APR for 60 months requires 120 bi-weekly payments of $236.11 with $500.00 down payment. Cost of borrowing is $2,504.35. Total obligation is $31,194.35. License, registration and taxes are extra and due on signing. †$500.00 credit on new 2019 MINI Cooper Clubman ALL4 models applies to finance option only. ****MSRP starting price for a base model 2019 MINI Cooper Clubman ALL4 is $28,690.00. Freight/PDI ($2,245.00), retailer administration fee (up to $399.00), OMVIC fee ($10.00), Tire Recycling Fee ($16.00), and A/C levy ($100.00) are extra. The distinguished MINI with all-terrain capabilities. Featuring an ultra-refined 5-seat cabin, elegant design accents, and ALL4 All-Wheel Drive as standard, it’s equipped to handle any road in style. All-inclusive starting price for a base model 2019 MINI Cooper S Clubman ALL4 is $34,460.00, which includes MSRP ($31,690.00), Freight/PDI ($2,245.00), retailer administration fee (up to $399.00), OMVIC fee ($10.00), Tire Recycling Fee ($16.00), and A/C levy ($100.00). **Lease example: Selling price of a 2019 MINI Cooper S Clubman ALL4 is $33,335.00, which includes MSRP ($31,690.00) and Freight/PDI ($2,245.00), less credit ($600.00), at 1.99 % APR for 48 months. Monthly lease payment is $393.29 with $1,125.00 down payment. First month’s lease payment, security deposit of approximately one month’s payment, retailer administration fee (up to $399.00), OMVIC fee ($10.00), A/C levy ($100.00), Tire Recycling Fee ($16.00), fees associated with PPSA ($53.73), licensing, registration and applicable taxes are extra and due on signing. Total obligation is $20,974.94 plus tax. The residual value of the vehicle at end of term is $15,211.20. Annual kilometers limited to 16,000. $0.15 per excess kilometer. Excess wear-and-tear charges may apply. †$600.00 credit on new 2019 MINI Cooper S Clubman ALL4 models applies to lease option only. ***Finance example: Selling price of a 2019 MINI Cooper S Clubman ALL4 is $33,335.00, which includes MSRP ($31,690.00) and Freight/PDI ($2,245.00), less credit ($600.00), at 0.99 % APR for 60 months requires 120 bi-weekly payments of $248.73 with $1,800.00 down payment. Cost of borrowing is $2,444.93. Total obligation is $34,134.93. License, registration and taxes are extra and due on signing. †$600.00 credit on new 2019 MINI Cooper S Clubman ALL4 models applies to finance option only. ****MSRP starting price for a base model 2019 MINI Cooper S Clubman ALL4 is $31,690.00. Freight/PDI ($2,245.00), retailer administration fee (up to $399.00), OMVIC fee ($10.00), Tire Recycling Fee ($16.00), and A/C levy ($100.00) are extra. THE MINI COOPER S CLUBMAN ALL4. The most refined MINI ever made. Well-appointed with sophisticated design touches, a bevy of premium standard features, and standard ALL4 All-Wheel Drive, it’s the epitome of form and function. All-inclusive starting price for a base model 2019 MINI John Cooper Works Clubman ALL4 is $40,960.00, which includes MSRP ($38,190.00), Freight/PDI ($2,245.00), retailer administration fee (up to $399.00), OMVIC fee ($10.00), Tire Recycling Fee ($16.00), and A/C levy ($100.00). **Lease example: Selling price of a 2019 MINI John Cooper Works Clubman ALL4 is $38,935.00, which includes MSRP ($38,190.00) and Freight/PDI ($2,245.00), less credit ($1,500.00), at 1.99 % APR for 48 months. Monthly lease payment is $447.35 with $1,700.00 down payment. First month’s lease payment, security deposit of approximately one month’s payment, retailer administration fee (up to $399.00), OMVIC fee ($10.00), A/C levy ($100.00), Tire Recycling Fee ($16.00), fees associated with PPSA ($53.73), licensing, registration and applicable taxes are extra and due on signing. Total obligation is $24,198.66 plus tax. The residual value of the vehicle at end of term is $17,949.30. Annual kilometers limited to 16,000. $0.15 per excess kilometer. Excess wear-and-tear charges may apply. †$1,500.00 credit on new 2019 MINI John Cooper Works Clubman ALL4 models applies to lease option only. ***Finance example: Selling price of a 2019 MINI John Cooper Works Clubman ALL4 is $38,935.00, which includes MSRP ($38,190.00) and Freight/PDI ($2,245.00), less credit ($1,500.00), at 0.99 % APR for 60 months requires 120 bi-weekly payments of $297.24 with $1,250.00 down payment. Cost of borrowing is $1,700.94. Total obligation is $39,890.94. License, registration and taxes are extra and due on signing. †$1,500.00 credit on new 2019 MINI John Cooper Works Clubman ALL4 models applies to finance option only. ****MSRP starting price for a base model 2019 MINI John Cooper Works Clubman ALL4 is $38,190.00. Freight/PDI ($2,245.00), retailer administration fee (up to $399.00), OMVIC fee ($10.00), Tire Recycling Fee ($16.00), and A/C levy ($100.00) are extra. THE MINI JOHN COOPER WORKS CLUBMAN ALL4. The most powerful MINI Clubman available, outfitted with top-of-the-line materials, signature design details, advanced cockpit technology, and ALL4 All-Wheel Drive to tackle terrain in town and country. All-inclusive starting price for a base model 2019 MINI Cooper 3 door is $25,860.00, which includes MSRP ($23,090.00), Freight/PDI ($2,245.00), retailer administration fee (up to $399.00), OMVIC fee ($10.00), Tire Recycling Fee ($16.00), and A/C levy ($100.00). **Lease example: Selling price of a 2019 MINI Cooper 3 door is $24,935.00, which includes MSRP ($23,090.00) and Freight/PDI ($2,245.00), less credit ($400.00), at 1.99 % APR for 48 months. Monthly lease payment is $312.10 with $500.00 down payment. First month’s lease payment, security deposit of approximately one month’s payment, retailer administration fee (up to $399.00), OMVIC fee ($10.00), A/C levy ($100.00), Tire Recycling Fee ($16.00), fees associated with PPSA ($53.73), licensing, registration and applicable taxes are extra and due on signing. Total obligation is $16,371.54 plus tax. The residual value of the vehicle at end of term is $10,852.30. Annual kilometers limited to 16,000. $0.15 per excess kilometer. Excess wear-and-tear charges may apply. †$400.00 credit on new 2019 MINI Cooper 3 door models applies to lease option only. ***Finance example: Selling price of a 2019 MINI Cooper 3 door is $24,935.00, which includes MSRP ($23,090.00) and Freight/PDI ($2,245.00), less credit ($400.00), at 0.99 % APR for 60 months requires 120 bi-weekly payments of $188.79 with $1,000.00 down payment. Cost of borrowing is $2,452.15. Total obligation is $25,542.15. License, registration and taxes are extra and due on signing. †$400.00 credit on new 2019 MINI Cooper 3 door models applies to finance option only. ****MSRP starting price for a base model 2019 MINI Cooper 3 door is $23,090.00. Freight/PDI ($2,245.00), retailer administration fee (up to $399.00), OMVIC fee ($10.00), Tire Recycling Fee ($16.00), and A/C levy ($100.00) are extra. THE MINI COOPER 3 DOOR. The original icon, reborn for modern motoring. Equipped with a fast yet fuel-efficient Twin Power Turbo Engine and plenty of MINI’s revered handling. All-inclusive starting price for a base model 2019 MINI Cooper S 3 door is $30,160.00, which includes MSRP ($27,390.00), Freight/PDI ($2,245.00), retailer administration fee (up to $399.00), OMVIC fee ($10.00), Tire Recycling Fee ($16.00), and A/C levy ($100.00). **Lease example: Selling price of a 2019 MINI Cooper S 3 door is $29,135.00, which includes MSRP ($27,390.00) and Freight/PDI ($2,245.00), less credit ($500.00), at 1.99 % APR for 48 months. Monthly lease payment is $354.03 with $1,150.00 down payment. First month’s lease payment, security deposit of approximately one month’s payment, retailer administration fee (up to $399.00), OMVIC fee ($10.00), A/C levy ($100.00), Tire Recycling Fee ($16.00), fees associated with PPSA ($53.73), licensing, registration and applicable taxes are extra and due on signing. Total obligation is $19,076.31 plus tax. The residual value of the vehicle at end of term is $12,599.40. Annual kilometers limited to 16,000. $0.15 per excess kilometer. Excess wear-and-tear charges may apply. †$500.00 credit on new 2019 MINI Cooper S 3 door models applies to lease option only. ***Finance example: Selling price of a 2019 MINI Cooper S 3 door is $29,135.00, which includes MSRP ($27,390.00) and Freight/PDI ($2,245.00), less credit ($500.00), at 0.99 % APR for 60 months requires 120 bi-weekly payments of $220.34 with $1,200.00 down payment. Cost of borrowing is $2,453.61. Total obligation is $29,843.61. License, registration and taxes are extra and due on signing. †$500.00 credit on new 2019 MINI Cooper S 3 door models applies to finance option only. ****MSRP starting price for a base model 2019 MINI Cooper S 3 door is $27,390.00. Freight/PDI ($2,245.00), retailer administration fee (up to $399.00), OMVIC fee ($10.00), Tire Recycling Fee ($16.00), and A/C levy ($100.00) are extra. THE MINI COOPER S 3 DOOR. The feistier MINI 3 door, featuring a sporty dual exhaust, larger air intakes, and a Twin Power Turbo engine boasting 189 hp and 207 ft/lb of torque. All-inclusive starting price for a base model 2019 MINI John Cooper Works 3 door is $37,660.00, which includes MSRP ($34,890.00), Freight/PDI ($2,245.00), retailer administration fee (up to $399.00), OMVIC fee ($10.00), Tire Recycling Fee ($16.00), and A/C levy ($100.00). **Lease example: Selling price of a 2019 MINI John Cooper Works 3 door is $36,385.00, which includes MSRP ($34,890.00) and Freight/PDI ($2,245.00), less credit ($750.00), at 1.99 % APR for 48 months. Monthly lease payment is $441.43 with $1,500.00 down payment. First month’s lease payment, security deposit of approximately one month’s payment, retailer administration fee (up to $399.00), OMVIC fee ($10.00), A/C levy ($100.00), Tire Recycling Fee ($16.00), fees associated with PPSA ($53.73), licensing, registration and applicable taxes are extra and due on signing. Total obligation is $23,708.85 plus tax. The residual value of the vehicle at end of term is $15,700.50. Annual kilometers limited to 16,000. $0.15 per excess kilometer. Excess wear-and-tear charges may apply. †$750.00 credit on new 2019 MINI John Cooper Works 3 door models applies to lease option only. ***Finance example: Selling price of a 2019 MINI John Cooper Works 3 door is $36,385.00, which includes MSRP ($34,890.00) and Freight/PDI ($2,245.00), less credit ($750.00), at 0.99 % APR for 60 months requires 120 bi-weekly payments of $276.73 with $1,300.00 down payment. Cost of borrowing is $2,384.99. Total obligation is $37,274.99. License, registration and taxes are extra and due on signing. †$750.00 credit on new 2019 MINI John Cooper Works 3 door models applies to finance option only. ****MSRP starting price for a base model 2019 MINI John Cooper Works 3 door is $34,890.00. Freight/PDI ($2,245.00), retailer administration fee (up to $399.00), OMVIC fee ($10.00), Tire Recycling Fee ($16.00), and A/C levy ($100.00) are extra. THE MINI JOHN COOPER WORKS 3 DOOR. The most powerful MINI 3 door available, equipped with racing-class performance upgrades, motorsport-inspired accents, and a Twin Power Turbo engine capable of hitting 100 km/h in a blistering 6.1 seconds. **Lease example: Selling price of a 2019 MINI Cooper Countryman ALL4 is $32,835.00, which includes MSRP ($31,090.00) and Freight/PDI ($2,245.00), less credit ($500.00), at 1.99 % APR for 48 months. Monthly lease payment is $388.76 with $1,100.00 down payment. First month’s lease payment, security deposit of approximately one month’s payment, retailer administration fee (up to $399.00), OMVIC fee ($10.00), A/C levy ($100.00), Tire Recycling Fee ($16.00), fees associated with PPSA ($53.73), licensing, registration and applicable taxes are extra and due on signing. Total obligation is $20,728.15 plus tax. The residual value of the vehicle at end of term is $14,923.20. Annual kilometers limited to 16,000. $0.15 per excess kilometer. Excess wear-and-tear charges may apply. †$500.00 credit on new 2019 MINI Cooper Countryman ALL4 models applies to lease option only. ****MSRP starting price for a base model 2019 MINI Cooper Countryman ALL4 is $31,090.00. Freight/PDI ($2,245.00), retailer administration fee (up to $399.00), OMVIC fee ($10.00), Tire Recycling Fee ($16.00), and A/C levy ($100.00) are extra. THE MINI COOPER COUNTRYMAN ALL4. The most adventurous MINI yet, featuring ample space for every escape, ALL4 All-Wheel Drive for every road, and a suite of practical features to make every journey more enjoyable. All-inclusive starting price for a base model 2019 MINI Cooper S Countryman ALL4 is $36,860.00, which includes MSRP ($34,090.00), Freight/PDI ($2,245.00), retailer administration fee (up to $399.00), OMVIC fee ($10.00), Tire Recycling Fee ($16.00), and A/C levy ($100.00). **Lease example: Selling price of a 2019 MINI Cooper S Countryman ALL4 is $35,735.00, which includes MSRP ($34,090.00) and Freight/PDI ($2,245.00), less credit ($600.00), at 1.99 % APR for 48 months. Monthly lease payment is $415.18 with $1,450.00 down payment. First month’s lease payment, security deposit of approximately one month’s payment, retailer administration fee (up to $399.00), OMVIC fee ($10.00), A/C levy ($100.00), Tire Recycling Fee ($16.00), fees associated with PPSA ($53.73), licensing, registration and applicable taxes are extra and due on signing. Total obligation is $22,372.77 plus tax. The residual value of the vehicle at end of term is $16,363.20. Annual kilometers limited to 16,000. $0.15 per excess kilometer. Excess wear-and-tear charges may apply. †$600.00 credit on new 2019 MINI Cooper S Countryman ALL4 models applies to lease option only. ***Finance example: Selling price of a 2019 MINI Cooper S Countryman ALL4 is $35,735.00, which includes MSRP ($34,090.00) and Freight/PDI ($2,245.00), less credit ($600.00), at 0.99 % APR for 60 months requires 120 bi-weekly payments of $270.82 with $1,400.00 down payment. Cost of borrowing is $2,515.96. Total obligation is $36,605.96. License, registration and taxes are extra and due on signing. †$600.00 credit on new 2019 MINI Cooper S Countryman ALL4 models applies to finance option only. ****MSRP starting price for a base model 2019 MINI Cooper S Countryman ALL4 is $34,090.00. Freight/PDI ($2,245.00), retailer administration fee (up to $399.00), OMVIC fee ($10.00), Tire Recycling Fee ($16.00), and A/C levy ($100.00) are extra. THE MINI COOPER S COUNTRYMAN ALL4. The more muscular MINI Countryman ALL4, equipped with a 189-hp Twin Power Turbo engine, unprecedented interior space, and ALL4 All-Wheel Drive to conquer challenging conditions and rugged roads with ease. All-inclusive starting price for a base model 2019 MINI John Cooper Works Countryman ALL4 is $42,560.00, which includes MSRP ($39,790.00), Freight/PDI ($2,245.00), retailer administration fee (up to $399.00), OMVIC fee ($10.00), Tire Recycling Fee ($16.00), and A/C levy ($100.00). **Lease example: Selling price of a 2019 MINI John Cooper Works Countryman ALL4 is $40,535.00, which includes MSRP ($39,790.00) and Freight/PDI ($2,245.00), less credit ($1,500.00), at 1.99 % APR for 48 months. Monthly lease payment is $464.95 with $1,425.00 down payment. First month’s lease payment, security deposit of approximately one month’s payment, retailer administration fee (up to $399.00), OMVIC fee ($10.00), A/C levy ($100.00), Tire Recycling Fee ($16.00), fees associated with PPSA ($53.73), licensing, registration and applicable taxes are extra and due on signing. Total obligation is $24,786.34 plus tax. The residual value of the vehicle at end of term is $19,099.20. Annual kilometers limited to 16,000. $0.15 per excess kilometer. Excess wear-and-tear charges may apply. †$1,500.00 credit on new 2019 MINI John Cooper Works Countryman ALL4 models applies to lease option only. ***Finance example: Selling price of a 2019 MINI John Cooper Works Countryman ALL4 is $40,535.00, which includes MSRP ($39,790.00) and Freight/PDI ($2,245.00), less credit ($1,500.00), at 0.99 % APR for 60 months requires 120 bi-weekly payments of $305.91 with $1,750.00 down payment. Cost of borrowing is $1,728.84. Total obligation is $41,518.84. License, registration and taxes are extra and due on signing. †$1,500.00 credit on new 2019 MINI John Cooper Works Countryman ALL4 models applies to finance option only. ****MSRP starting price for a base model 2019 MINI John Cooper Works Countryman ALL4 is $39,790.00. Freight/PDI ($2,245.00), retailer administration fee (up to $399.00), OMVIC fee ($10.00), Tire Recycling Fee ($16.00), and A/C levy ($100.00) are extra. THE MINI JOHN COOPER WORKS COUNTRYMAN ALL4. The most powerful MINI Countryman available. Featuring ALL4 All-Wheel Drive, a sport suspension system, and a 228-hp Twin Power Turbo engine, it’s ready to accommodate all adrenaline-fueled adventures.